The University of Saskatchewan Computer Museum was first conceived of in late 2001, over lunch at the Faculty Club. Further meetings came of this, and on February 8th, 2002, the Museum was formed, again over a swanky Faculty Club buffet. The original pioneers that attended these meetings were Rick Bunt, Merlin Hansen, Greg Oster, David Schwab, Terry Roebuck, and Robert Grosse. The early years of the museum involved collecting equipment, software, and other artefacts. 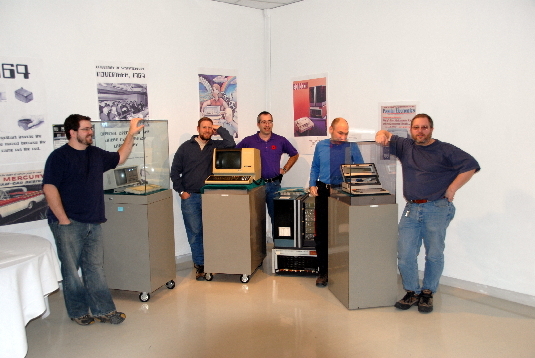 Then, in March of 2004, the Museum was invited to participate in a Techology History Display on the main floor of the Main Branch of the University Library. This Display was developed by a student in the College of Engineering; the Museum added to it from our collection: an early IBM XT 5150 microcomputer, and an early IBM ThinkPad laptop. This was the Museum's public debut as an organization, and the display was available for viewing until September, 2004. In August, 2005, the decision was made to establish regular monthly meetings, and to begin aggressively pursuring a physical home for our collection. The process also began to become a recognized University entity on Campus. As of March 2006, both of these goals have become realized; the Museum has acquired a permanent storage facility and several display cases around campus, and has become an official Campus organization. We're not content to rest on our laurels, however. The Museum staff are working to catalogue our ever-growing collection, and collaborating with the Department of Computer Science CMPT 355 class to develop a database that we can use for our system. The Museum is also actively pursuing funding, and always on the lookout for more display space. Download our campus self-guided tour map!